Authors: Abdulganieva D.I., Kirillova E.R., Bombina L.K., Khusainova A.K., Bol'shakov N.A., Sabirova G.S. The article is dedicated to Professor L.L. Fofanof’s scientific activity. He headed the faculty therapeutic clinic of Kazan Imperial University in 1915-1920. Being a student L.L. Fofanov was interested in pathological anatomy and physiology. His dissertation «To physiology of n. depressoris» was dedicated to studying the vasomotor center. During his visit in Germany he worked a lot. In Charite together with Professor His he studied gout and its treatment with Radium emanation. In Halle clinic under Professor Schmidt’s supervision he studied assimilation of starch in normal and pathological digestion. L.L. Fofanov also made a contribution to tuberculosis treatment: with professor V.F. Orlovskiy he studied treatment of tuberculosis with simulated pneumothorax. In his research professor L.L. Fofanov paid great attention to the issues of pathogenesis and pathogenetic substantiation of the clinical manifestation and treatment. During the World War I and Civil War he fought against typhus epidemies: he saw patients, gave lectures, studied the features of myocardial involvement. He died in 1920 from typhus. medicine history, history of KSMU, Kazan therapeutic school. London E.S. Das Radium in der Biologie und Medizin. Leipzig: Akademische Verlagsgesellsschaft m.b.H. 1911; 199 р. 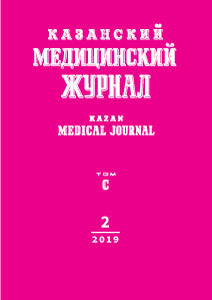 © 2019 Abdulganieva D.I., Kirillova E.R., Bombina L.K., Khusainova A.K., Bol'shakov N.A., Sabirova G.S.